In 2009, a group of community stakeholders came together to address a notable increase in the expulsion rates of children in early childhood programs. In addition the group recognized the need for developing systematic way of supporting teachers, children and families. The group of stakeholders reviewed a large body of evidence-based research to establish a framework for the development of a program. 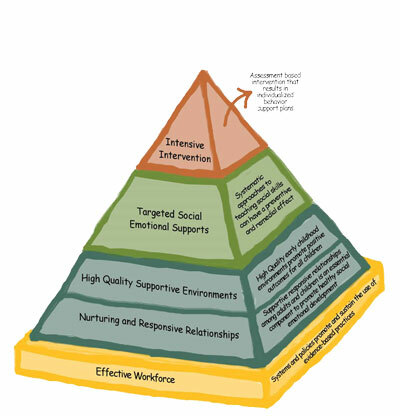 The Pyramid Model, as developed by The Center on the Social Emotional Foundations for Early Learning (CSEFEL) and The Technical Assistance Center on Social Emotional Intervention (TACSEI), provided the foundation for the SPEC program. After the initial foundation was laid by the group of stakeholders, our SPEC team of facilitators developed a series of in-depth and interactive trainings. The content from each of the trainings focuses on the three tiers of the CSEFEL pyramid. A scope and sequence to the implementation of program-wide PBIS was also developed. This helped programs identify a “pace” which is reasonable for completing necessary implementation activities. We also identified a list of evidence-based evaluation tools to inform on-going decision making. After nearly three years of planning, refining and developing a program, a formal launch occurred in 2012. A community-wide kickoff event was held where many early childhood programs were invited to learn more about the program and potential benefits. Four early childhood education programs, participated with SPEC in the first year. After the first year of inception, it has been with great privilege to announce that our community partnerships have grown to include 13 early childhood programs across four counties in South-Central Pennsylvania. Our SPEC program and it’s facilitators are part of a broader network in the state of Pennsylvania – the PAPBS Network. It is through this network that our facilitators remain connected to research, training opportunities and peer-to-peer networking. It has been the pleasure of our SPEC program facilitators to have presented at the Annual PAPBS Implementer’s Forum in the years 2012 and 2016. Topics included: “Implementing the Pyramid Model Community-wide” and “Increasing the Capacity of the Facilitator”. Additionally, our trained facilitators have presented at local YAAEYC and LAAEYC conferences for several years.